After President Donald Trump warned Russia in a tweet Wednesday that it should “get ready” for missile strikes against Syria, key lawmakers on Capitol Hill questioned whether threats of war should be made via social media while some Republican defense hawks urged Trump to act soon. Corker has called for “surgical strikes” against Syria to punish President Bashar al-Assad’s government for allegedly carrying out a chemical attack against Syrian civilians last week. Even as Trump appeared to announce a decision to launch strikes, White House officials said no final plans had been made. Trump has consulted allies in Europe to arrange a coordinated effort, and was planning to meet with top military leaders on Wednesday afternoon. Meanwhile, Democratic Sen. Chris Murphy of Connecticut warned that an attack wouldn’t help end the civil war in Syria and said Trump must seek approval from Congress before attacking Syria. Murphy is pushing Congress to pass a new Authorization for Use of Military Force to OK military action against Syria, although it’s not clear there is enough support in Congress to pass a new authorization. I hope cooler heads prevail, nobody wants more death and destruction. 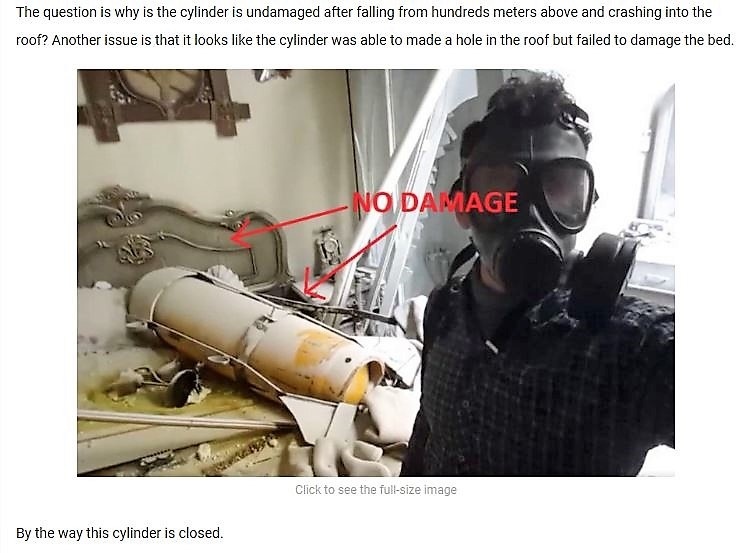 Assad supporters spread false claims on child gas attack victims. Screengrab of a video shared on social media by supporters of Syrian President Bashar al-Assad. 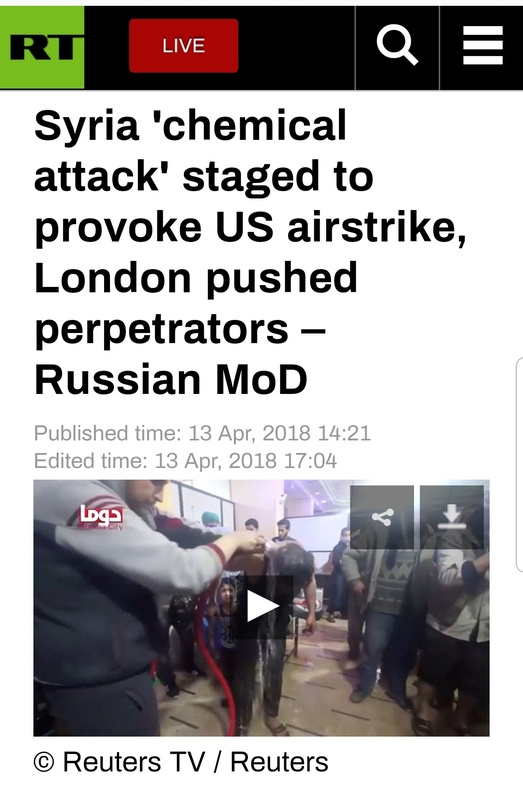 “Watch the staging of the chemical attack in Douma,” the title reads. 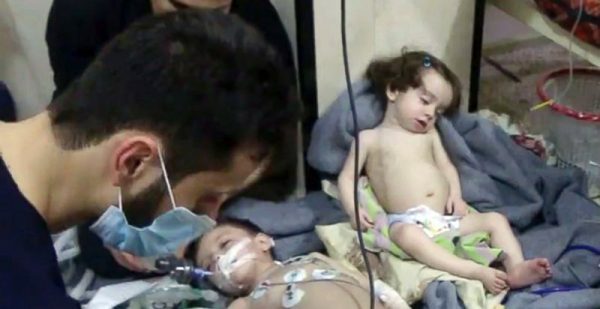 – 04/12/2018 Assad supporters spread false claims on child gas attack victims. 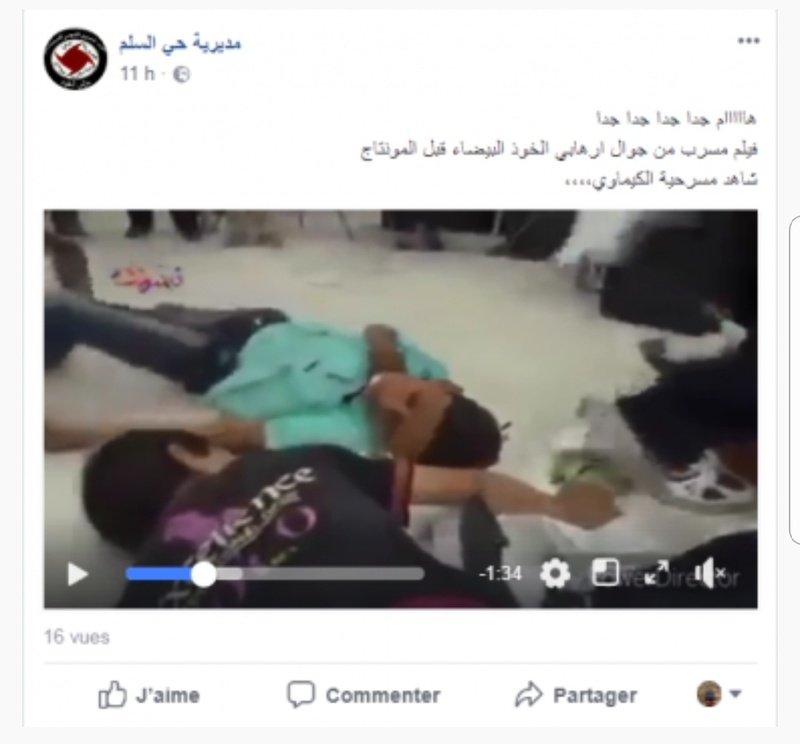 A video showing Syrian children pretending to suffocate and faint has been circulating on social media since April 7 by supporters of President Bashar al-Assad. 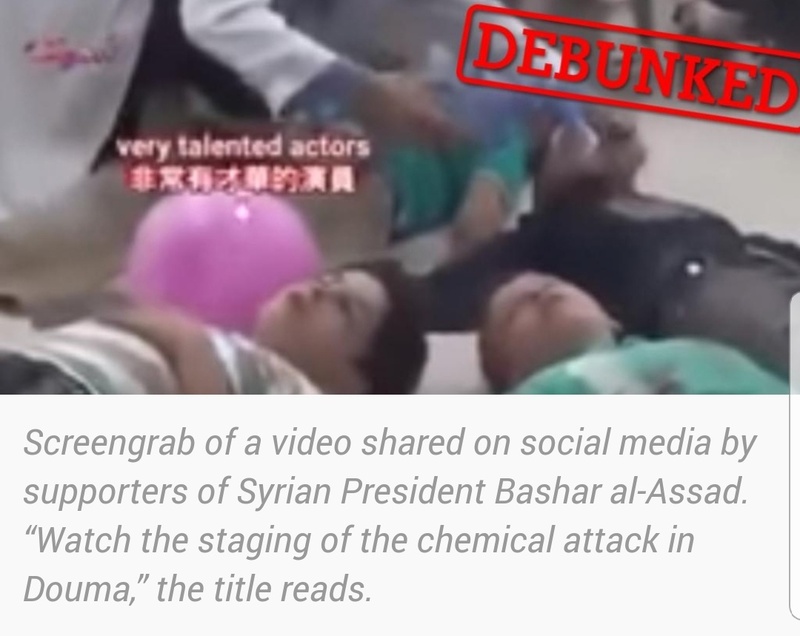 They say this video proves that the chemical attack on the city of Douma in Eastern Ghouta was staged by opponents of the Syrian regime. 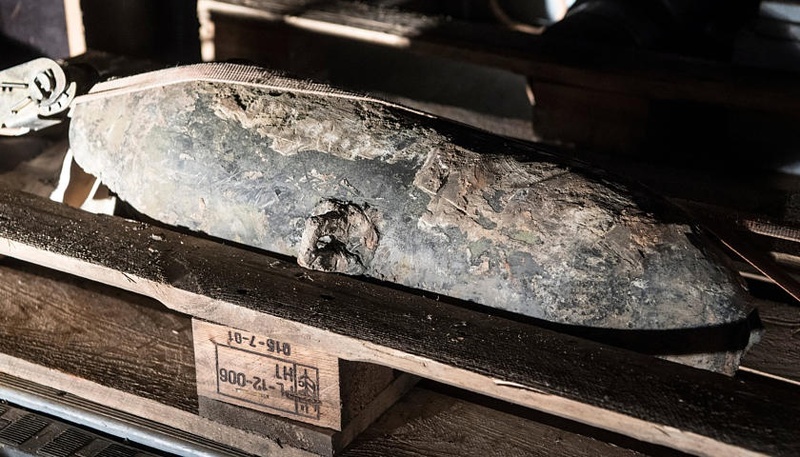 The video was indeed filmed in the Ghouta region – but back in 2013, as part of an effort by local activists to draw public attention to the dangers of chemical weapons. In the original six-minute version of the video, it is clearly explained that the scene is a dramatisation. The edited version of the video that is currently being shared by Assad supporters is just two minutes long. The first shot shows kids playing with a ball. Behind them, other children are sitting on chairs lined up in a row, as if they are about to watch a performance. Then, when a siren goes off, the children throw themselves on the ground and start writhing around. Men in white shirts run towards them and pretend to help them breathe with oxygen masks. Towards the end of the video, you can see the kids get up, unharmed, as the audience claps. https://uploads.disquscdn.com/images/29362c797ced13072626274ab1cf0a7632835bd27809ef5528c54996ca6e60ed.jpg Since April 7, the video has been shared on YouTube as well as pro-Assad Facebook pages. 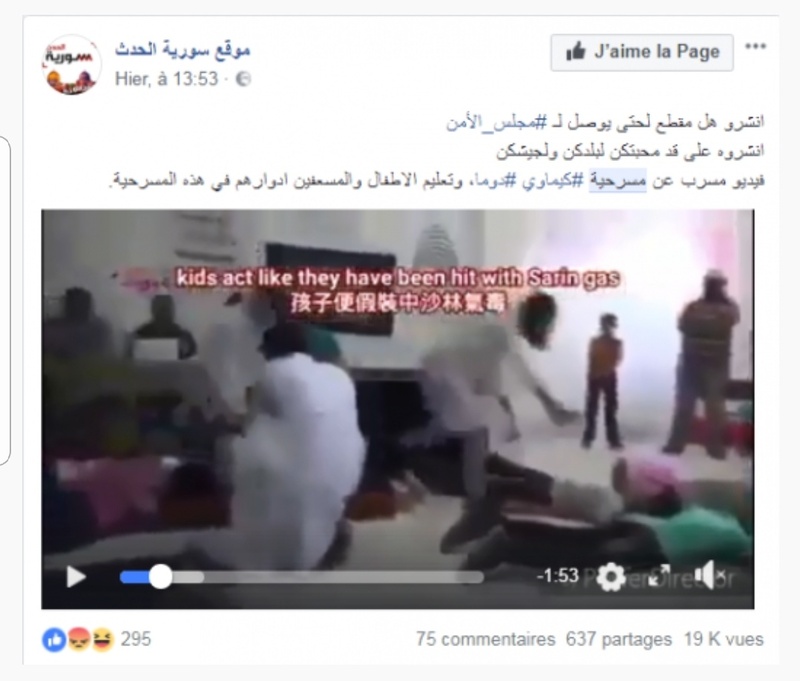 “Share this video so that it reaches the Security Council (…) In this staged version, children and fake emergency responders are being taught how to simulate a chemical attack in Douma,” reads a post on aFacebook page called Sourya alhadath (see below). The original video, posted on September 2013 on YouTube. The Syrian rebels accuse the regime of using chemical weapons against a hospital in Douma, Eastern Ghouta on April 7. According to medical charity Sams, at least 49 people were killed and dozens more injured. Numerous videos showing corpses in Douma have emerged since April 7. 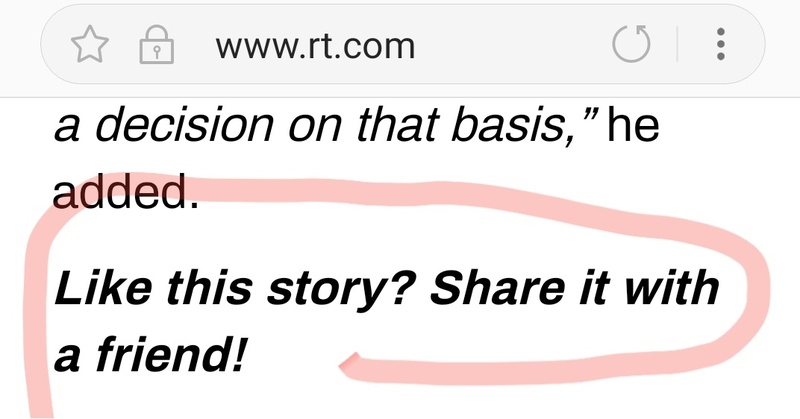 The independent investigative site Bellingcat has verified these videos’ authenticity. We’re sorry, currently there seems to be something wrong. By Leith Aboufadel – 13/04/20180’. Hacked! The silence of the Arab world is puzzling. One could expect that since it is their part of the Muslim world, they would care more. While the rest of the world is puzzled over the whether and when of the US President Trump’s announced attack on Syria, there is little to hear from Arab states. Background are diverse interests and interdependencies. Should it really come to an American attack, it is likely that he is supported by Saudi Arabia’s allies, at least verbally. 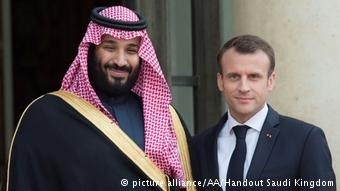 https://uploads.disquscdn.com/images/1ef6ad7256f9427aab2287c1f96bb9d0ae308123df075cf0257628daa6c057bf.jpg Saudi Crown Prince Muhammad bin Salman declares in Paris his willingness to participate in an attack on Syria. The official stance of Lebanon, in which power is divided into denominational breaking points, is not uniform. The Maronite President Michel Aoun found unusually clear words and last referred to Bashar al-Assad as the “legitimate president” and “sole representative of Syria”. On the other hand, Sunni Prime Minister Saad al-Hariri affirms that his country will be neutral on an American attack. Out of a total of 22 Arab states, perhaps Algeria could make a critical statement about an attack. Algiers has maintained excellent relations with the Syrian regime since the beginning of the Syrian crisis seven years ago, and never misses an opportunity to voice its rejection of foreign military intervention: from the Gulf Wars of 1990 and 2003 to the NATO attack in Libya and the Saudi Arabian war in Yemen. However, neither the position of the Arab League nor that of the individual Arab states are relevant for any attack against Syria. Ultimately, decisions are made in Western capitals and depend as much on Moscow’s reactions as possible. 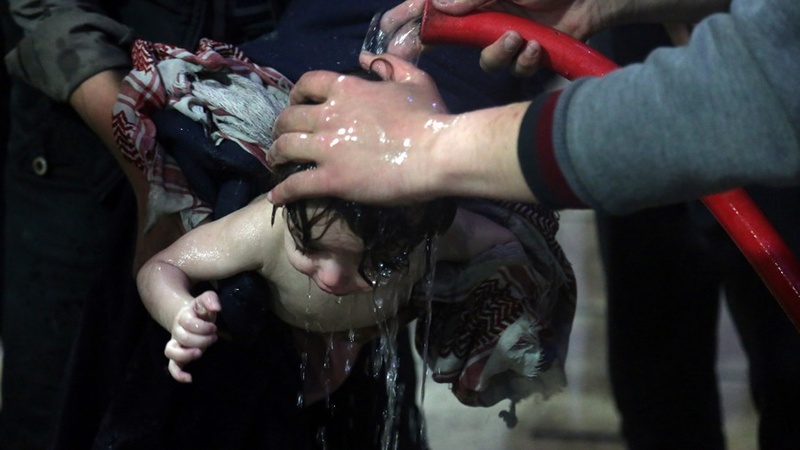 Than we have a photo showing a child being washed after what the White Helmets and other anti-government groups in Syria claim was a chemical weapons attack in Douma, Eastern Ghouta, on April 7. The edited version of the video that is currently being shared by Assad supporters is just two minutes long. The first shot shows kids playing with a ball. Behind them, other children are sitting on chairs lined up in a row, as if they are about to watch a performance. Then, when a siren goes off, the children throw themselves on the ground and start writhing around. It has been circulating on social media and southfront.org since April 7 by supporters of President Bashar al-Assad. We have hade more than enough bombs falling from hundreds meters above and remain undamaged until 10. April 2018, another bomb has been found in Frankfurt. https://uploads.disquscdn.com/images/3d435a082fe430e839d7b4ccb0d3eb823d94f2856ebd37455d8023b85d233aa2.jpg bombs falling from hundreds meters – undamaged…. https://uploads.disquscdn.com/images/66f1f2a112f154dc0af11ec985dacd2888626d0a077a9e61a8fc2d9739463dc4.jpg bombs falling from hundreds meters – undamaged…. What a sick joke! https://uploads.disquscdn.com/images/416324cdadd86a690231b570842ab5c8c617d24a36cd14ec4a44eea413233de8.jpg The Russian Defense Ministry has ‘presented what it says is proof’ that the reported chemical weapons attack in Syria was staged. https://uploads.disquscdn.com/images/bf40f5599b92946f3e1aded925573bc6d6db1bd8e5f67046a8a6ed5420c750f0.jpg the video has been shared on YouTube as well as pro-Assad Facebook pages and now on RT.com. ??? ?